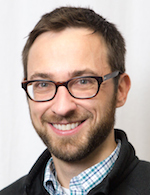 University of Wisconsin-Madison School of Education professor Nicholas Hillman, an expert on higher education financing and state funding models, prepared the following recommendation for members of the Joint Committee on Finance as they consider an outcomes-based funding proposal in the 2017-19 state budget. The committee is scheduled to discuss the University of Wisconsin System portion of the 2017-19 state budget at noon, Thursday, May 25. Livestream coverage is available on WisconsinEye. The following papers were prepared by the Legislative Fiscal Bureau in advance of the Joint Finance Committee executive session on the University of Wisconsin System portion of the 2017-19 biennial budget. Each paper includes a summary of Governor Walker’s budget provision and discussion points, along with options for the committee to consider when voting on that particular budget item. UW Pay plan A pay plan tied to presumed savings from a switch to self-insurance (see below) for all state employees would be offered in 2018 and 2019. Add language to state statutes that would give the university new power to regulate expression and criticism of that expression. Allow students to opt out of allocable segregated fees. Require institutions to develop 3-year degree programs. Require students to have internship/work experience before graduating. Require 60 credits transferable between UW and WTCS. The Group Insurance Board recommended a switch to self-insurance beginning in 2018, but the Joint Finance Committee must review the proposed changes before they go into effect. The committee received the formal recommendation to switch to self-insurance today and has 21 days to decide whether or not to reject the plan. The committee co-chairs and other members have publicly expressed concern over the plan in the past. Video from the PROFS/ASPRO forum on self-insurance is here. Several legislators, including the chairs of the Legislature’s higher education committees, announced their plans to introduce legislation that would direct the Board of Regents to draft a free speech policy that encourages all points of view. Regents would also be required to create rules that discipline students who interfere with campus free speech. PROFS is concerned about the reach of these proposals and has begun working with UW free speech experts on a response to these proposals. AB 299 (below), sponsored by Representative Jesse Kremer (R-Kewaskum) was introduced last week, and Senator Leah Vukmir (R-Brookfield) intends to introduce legislation (below) later this month. 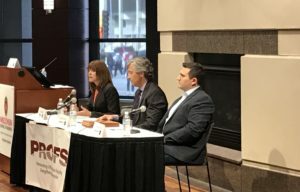 Thank you for the opportunity to talk about self-insurance in Wisconsin at the forum last month. ETF would like to direct people to the frequently asked questions on its website, as many of the questions from attendees are addressed here. 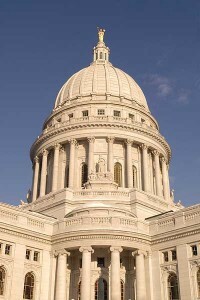 Please also check the It’s Your Choice group health insurance section and other resources at etf.wi.gov. Your questions are important to us and will help in developing future, relevant communications. Online information about group health insurance program changes for 2018 will be updated as soon as we know more details early this summer. For more timely information, please sign up for IYC E-Alerts: Health & Wellness and follow ETF on Twitter.